Ok, so I'm just a teeny bit behind in posting these specials...(family priorities do take precedence...so hopefully you understand). Hang in there with me and I'll get these all out to you sooner or later! Thank you for your patience! I don't think I'll get to all the specials by December 14, which is tomorrow? so...I'll just keep going with these until I get all 12 specials to you! I'll also make available all my kits WHILE SUPPLIES LAST...fair enough? One other note-don't forget that I'm offering 10% off any Retiring sets or accessories thru Friday December 14! Ok-on to the 3rd Christmas Special project....a 6-POINT STAR! 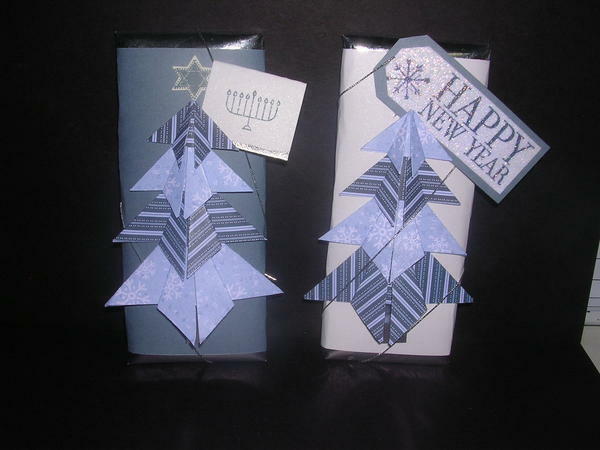 This idea originally came from a PaperCrafts magazine...I thought it was pretty cool and it seemed easy enough to do, so I gave it a try when I made a 6-point star ornament for an ornament swap with my demonstrator downline group-the S.O.S. Team (stands for S.aving O.verwhelmed S.tamper!) 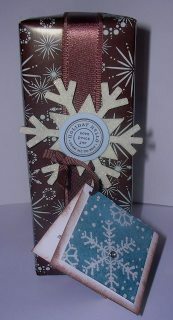 in November using Stampin' Up! 's Dashing Designer Series paper (which is still available for purchase till the end of December, but it is on the retired list!) and it came out really nice. Demonstrators don't have to come up with all their ideas on their own-we pick a theme, or a stamp set or product and we each come up with one idea and make enough for all demos participating...then SWAP our cards at our monthly downline meetings, group events, Stampin' Up! Convention, Leadership Conferences and so on...it's so cool to come back from a Convention or large gathering of demonstrators, with hundreds of card samples-all different! But each of us has to come up with only one design....With a brand new year just around the corner, January is a fantastic time to become a demonstrator! (to learn more about becoming a Stampin' Up! 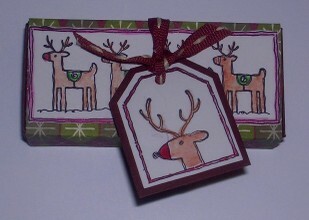 demonstrator, check out the links on the left to my Stampin' Up! website!) Be sure to let me know if you decide to give it a try-I'll be happy to answer any questions you have-just e-mail me! Of course these stars should not be limited to ornaments...get creative with them and attach them to presents, make cards with them, and see what other ideas you can come up with! If you have other ideas for these stars, please post them in the comments section! I'd love to hear what ideas you can come up with for these! I made a bunch of these projects for the craft fairs, and knew I should have made more...a few folks bought one and a couple there, then one lady came back and bought ALL of them! I bet she was giving them as office gifts to her friends...as she was naming them one by one-and finally just said-"I'll take them all!" Gotta love it when that happens! Next time I'll have to make alot more of these! These are surprisingly easy and fun to make! I haven't forgotten my Christmas Specials! I am SO sorry...I just spent the ENTIRE afternoon, doing a tutorial for my 3rd Christmas Special..but being new to this, because it took me so long to do, and it never occurred to me to SAVE it after I finished it-sooooo...I just learned that after all that hard work, --I LOST IT! I could just cry... but I realize that would certainly not change a thing, and it certainly does nothing for YOU! So, I am going to try to grin :) and bear it::::) and get back to the task of REDOING the whole blasted process..and I will start all over again...big breath-SIGH...ok-here we go! 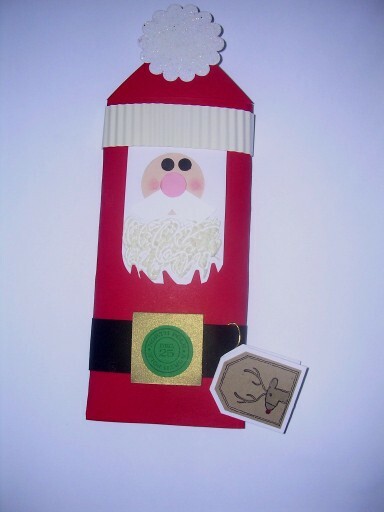 We interrupt our posting of Christmas specials to bring you this Stampin' Up! news! If you would like to place an order, purchase a Gift Certificate, or sign up for our upcoming class "Stocking Stuffers & Last Minute Gifts" (December 14, Friday 7pm-9:30pm) or RSVP for to attend our free Open House Retirement Party (December 15 10-12 or 1:30-3:00) please e-mail me. "Got Crackers?" 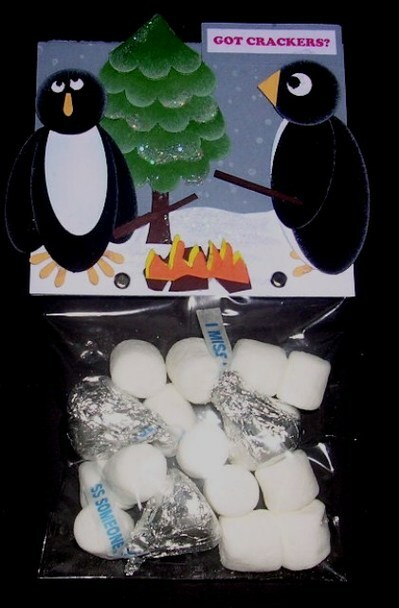 Penguin S'mores Kit! I love penguins! Punches are all the rage too and it's no wonder why! There are so many creative things you can make with them! I love creating with punches, so when I saw some cute punch ideas for penguins, I decided to alter them a bit and created this adorable stocking stuffer/cello bag gift which is made using only one snowflake stamp, and eight different Stampin' Up! punches! If you would rather attend a class in person to make this, be sure to sign up for my Stocking Stuffer & Last Minute Gifts Class offered on 12/12 and 12/14! For $25, you can make your choice of a variety of GREAT gifts! But hurry...you must register for the 12/12 class by 12/10, and the 12/14 class by 12/12! Check out my class schedule HERE or follow the link to my Stampin' Up! Events to the left. It's time to bid farewell to some Stampin' Up! stamp sets! If you are in the local northern Sussex County NJ area, I'm having a HOLIDAY OPEN HOUSE RETIREMENT PARTY (no I'm not retiring! )-BUT some Stampin' Up! stamp sets are! Click on my Events under the Stampin' Up! links to the left for details regarding this fun semi-annual event! Some stamp sets from the The Fall-Winter 2007 Collection will soon be retired! They will only be available for purchase until January 1, when this catalog will be replaced by the new Spring-Summer 2008 Collection! This is the first two-catalog year for Stampin' Up!. This means that there are now two retired lists for this 2007-2008 Stampin 'Up! year. The first retired list is now available-it lists all the sets that will be retiring-never to be available again! The list is out just in time for your holiday purchasing needs! 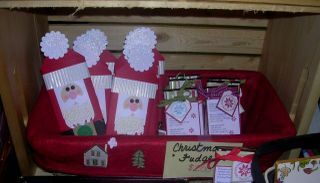 Consider purchasing retiring sets-they make the perfect gift for yourself or someone else on your shopping list! (especially stampers and scrapbookers!) Order early for delivery in time for the holiday! Retired stamps & accessories are only available while supplies last, so this is another reason not to delay in ordering the sets you really want. Contact me (e-mail address to the left) if you would like to place an order...but first be sure you look over my Twelve Days of Holiday Ideas & Specials...which I will start posting later today and each day for the next eleven days, so don't forget to check back later! Oh where oh where has your Su! demonstrator gone.. 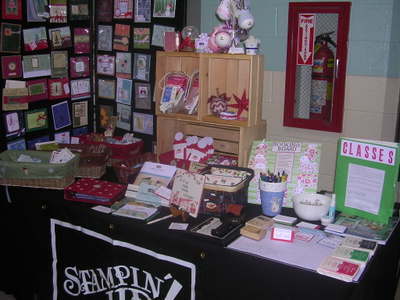 I used to do this craft show every year until I became a Stampin' Up! demonstrator in 1996. At that point in time, I concentrated all my energy on Stampin' Up! home party shows (until recently, called "workshops"). My kids were very young then and I wanted to build my home business, yet I still wanted to be able to attend their school events. My Stampin' Up! business enabled me to be able to do this...it was an answer to a prayer request I had for years-to be able to quit my full-time job (computer operations at a popular bank, which involved quite a long daily commute) to become a stay-at-home mom with my children-and make a difference in their lives! Back when I first started with Stampin' Up! I was doing as many as 12-16 workshops a month (only because I was super-engergized-it wasn't a requirement!) Then I cut back on workshops, branched out and started offering some classes in my country kitchen...I used to put an extension onto my kitchen table just for classes to accomodate my customers- took up my whole kitchen so when it was time for my kids to go to bed, they had to crawl under the kitchen table to get to their bedroom! My business had expanded so, that our small master bedroom was lined with containers & organizers holding all my Stampin' Up! supplies! My husband would always say "you need a room just to store all this stuff!" so...the idea was born. In 2000, I didn't go on my annual Leadership Trip with Stampin' Up! but instead, we started an Add-A-Level rennovation to take all three first level bedrooms and create a Stamp Studio in place of two of the bedrooms; then we created an Office using the third bedroom. Former Garage area space was used to establish a NEW front door entrance. The Two-Car Garage is now a one car garage. The plan was to create three bedrooms upstairs on the 3rd floor, including a Linen Closet, kid's bathroom, & a master bathroom. (This is now a 3 story split level house). On the third floor is the master bedroom equipped with a private master bath, and dressing room, the kids bedrooms and their bathroom. When Stampin' Up!' recently announced a change in their Angel Policy allowing demonstrators to conduct business from a permanent location, I decided to get back into the arena of craft shows in the area. I love using rubber stamps to create magnificent cards and other paper crafts, but i also am very fond of creating non-card items such as home decor, 3-D and gift items. (I also dapple in scrapbooking). We now have a very unique split level custom built home with all of the above! We never could have done it though, without the contribution of my Stampin' Up! business! If you would like to learn more about doing what I do-which is teaching folks to FIND YOUR HIDDEN CREATIVITY by simply using rubber stamp techniques along with some awesome accessories to create cool cards, papercrafts ideas, keepsake memory gifts, home decor projects and many other countless items...please contact me now by calling 973-827-1168! I would love to talk with you in more depth about my experience as a Stampin' Up! demonstrator and discuss how this opportunity can help you and your family. Or, you can always host a party of 9 or more of your friends and host your own party as well as reap the hostess benefits! If I can be of any other service to you, please feel free to contact me.